Full disclosure – I received a free copy of this book from the author as part of his “A-Team” in exchange for an honest review. 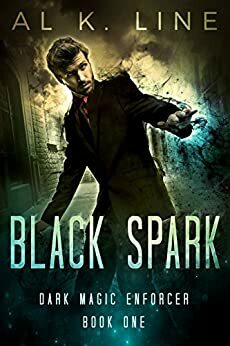 Faz Pound; “Black Spark” to those who love him and hate him, is a Dark Magic Enforcer. For those who are part of the Hidden world of magic, he is one of many who keep both human and non-human magic users in line so the magic stays hidden to the regular world and their existence is not exposed. He’s good at what he does… probably the best… but he just screwed up. After coming to his senses in a city park with no recollection of how he got there and no memory of who or what he is, Faz realizes that he has just used dark magic to kill the local Chessmaster. The very secret he is charged with protecting and preserving, he has just exposed. Now the race is on to undo what he has done to save his skin and the entire Hidden world. But how do you do that? Can you really “un-kill” someone? With the help of his Vampire friend/girlfriend, a wily Necromancer and an unwilling and unsavory “babysitter” in tow… just to keep him in line, Faz sets out to find out what happened to him and reverse his mistake. This story starts fast and doesn’t slow down and as far as mythical creatures go, there are plenty. Vampires, Zombies, Succubi, Fae, Trolls, Dwarves… the only thing that was missing were Werewolves and Dragons, although I don’t doubt we may see them soon. I love the concept of each area of the world having their own conclave of sorts of ultimate magical beings basically acting as the governing bodies of the hidden and the “enforcers” as the police network to track and apprehend those who abuse or otherwise misuse their power. While the concept of the magical world existing in tandem with the non-magical world and the latter completely unaware of the former is not a new concept, this book definitely explores it in a way that is less innocent and has more substance. All in all, a great read. Looking forward to the next in the series!